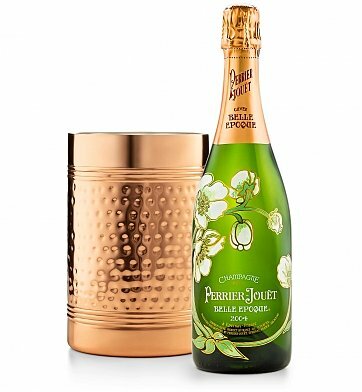 With its distinctive hammered design and polished finish, this gift is an apt showcase for Perrier's most celebrated labor. An enduring gift worthy of any occasion. One bottle of Perrier-Jouet Belle Epoque Fleur De Champagne For more information on this wine, please see the Tasting Notes. Stainless Steel Hammered Polished Wine Chiller. Perrier-Jouet Belle Epoque and Double Walled Wine Chiller is a hand delivered gift. These gifts are delivered by one of our local design centers located throughout the United States and Canada. Same day delivery is available for most gifts when ordered before the cutoff time. The cutoff time for Perrier-Jouet Belle Epoque and Double Walled Wine Chiller is in the recipient's time zone. Hammered Wine & Champagne ChillerThis double walled wine chiller presents your wine or Champagne at the proper temperature, preventing condensation from ruining your tabletop, all while displaying stunning good looks. The hammered copper exterior adds warmth and sophistication to the bottle service, while a tarnish-resistant finish makes for easy maintenance. Perrier Jouet Belle EpoqueHoneyed apple, white peach and floral notes give way to a soft, toasty finish in this delicate champagne, known around the world for its loveliness and elegance. All the lightness of white flowers combine with hints of honeyed apple, white peach and lemon zest in this fresh, stylish champange. Silky and elegant, this well-structured champagne has a base of mineral notes from the best chardonnay. On the palate, floral and fruit gives way to subtly spicy hints for a pleasant finish. Served slightly chilled, this champagne is best enjoyed now through 2019. Perrier-Jouet Belle Epoque Fleur De Champagne and chiller. Perfect for real estate agents, clients, colleagues and employees.